Cryptocurrency volatility has generated sensationalized headlines over the past year, with cyclical valuation drops and surges that make even Apple's stock price look relaxed in comparison. 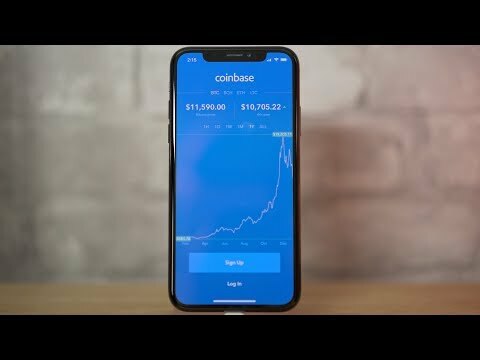 Here's a look at how cryptocurrencies such as Bitcoin and Ethereum's "Ether" work, and how you can get involved in trading them at their current lows with Coinbase, a popular and easy-to-use iOS app. The concept of cryptocurrencies is relatively simple: rather than being a fiat currency tied to the monetary policy of a central bank of the country that issues it (like the EU Euro or US Dollar), a cryptocurrency such as Bitcoin or Ether is decentralized, and its valuation comes from whatever the market is willing to pay for it. There is no intermediary bank in crypto transactions; instead, transactions that involve buying or selling crypto in exchange for another currency or for goods and services occur directly between users and are recorded in a "blockchain," a public ledger that exists as a distributed database. Essentially, a crypto "coin" or (fraction of a coin) is a number sent to the anonymous address of a user. Transactions are effectively an encrypted message that delivers the identifying number of the coin encrypted using the public key of the buyer and a secret random private key of the transaction. This transaction is recorded in the blockchain, allowing the buyer to later sell their received crypto by using the correct private key (encryption secret) and using it to transfer the crypto to a new buyer using that buyer's public key. Algorithms can verify that the coin hasn't been previously spent because all transactions are recorded publicly (albeit anonymously) across various nodes of the distributed database that is the blockchain. Just as with an encrypted hard drive (or encrypted iPhone), if the person possessing crypto "coin" loses their private keys, there is no way to recover their proof of ownership. That coin is essentially lost like the data on an encrypted hard drive or iOS device, or like physical money thrown irretrievably down a deep hole. Bitcoin, the first cryptocurrency, originated in concept back in 2008. In 2010, one Bitcoin was worth 6 cents. Within a year, it was selling for $1. By 2013 it exceeded $100, and then grew to nearly $1,000 by the end of that year. However, crypto can lose valuation quickly as well: over the next three years, Bitcoin collapsed down as far as $250 before finally (and slowly) recovering back to $1,000 levels early in 2017. Across 2017, Bitcoin and other cryptos again began to explode in valuation. Bitcoin jumped from around $1,000 to a peak of nearly $20,000 over the past year. In January alone, however, it has dropped down to current prices around $10,000. One reason for the wild volatility of cryptocurrency valuation is a flood of new buyers entering the market, enabled in part by easy to use tools such as Coinbase. Celebrity endorsements have also helped broaden the awareness and interest in buying crypto. Previously, buying and selling crypto required a greater technical understanding of how to perform complex transactions. It also required that buyers manage their own transaction keys in a "digital wallet" they possessed, generally stored on their computer. This data needed to be securely backed up and safeguarded, because if your keys are lost or stolen so is the value of your cryptocurrency holdings. There are many stories of crypto buyers losing millions of dollars worth of crypto from their digital wallet due to a hard drive device failure, destruction or theft. If the device holding a digital wallet is encrypted and the password is lost, so is all of the crypto stored on it. When the U.S. government shutdown the Silk Road darkweb marketplace for illegal drugs in 2013, it seized the laptop of its alleged operator, Ross William Ulbricht, and claimed the 144,336 Bitcoin stored on it. The Department of Justice later announced it had sold the seized crypto for about $48 million. However, had the U.S. government held the crypto (or if Ulbricht had not gotten caught using his computer in a San Francisco public library), that Bitcoin would have been worth around $2.8 billion earlier this month, and over $1.4 billion at the current Bitcoin valuation. Some of the reasons for cryptocurrency rapidly losing value at given points in time are: the negative sentiment swirling around banks and traditional investors who are either threatened by change or are wary of crypto valuations being an unfamiliar bubble that could collapse; and a threat of new regulations and the announcement of bans on certain crypto activities that have recently occured in China and South Korea. In December, China's ban on the introduction of new crypto currencies ("ICOs") caused a panicked drop in existing cryptocurrencies. However, they subsequently recovered and rose far higher afterward. This month, South Korea's efforts to get a handle on broad, speculative investment in crypto to prevent fraud similarly appear to have depressed valuations. But after bottoming out on the news, prices have since began to recover. These wild swings in valuation are not new or unprecedented. Last year, January crypto prices for Bitcoin swung from $1,000 down to $830 and back up again. This year, over the last 30 days Bitcoin prices have swung from nearly $19,000 down to $12,500 up to $17,000 and back down below $10,000. The most sensational clickbait stories pick dramatic periods of change to suggest a one way trend, when the real history of Bitcoin prices has been a rollercoaster of ups and downs. While peak crypto prices offer an attractive selling opportunity, current depressed lows can present a buying opportunity for anyone interested in gambling on the future of crypto valuations. Note: AppleInsider does not offer investment advice and strongly cautions readers not to gamble with more money than they can afford to lose. Beyond the original Bitcoin, there are many variant cryptocurrencies each running their own blockchain. Some are virtually identical (such as Bitcoin Cash, a fork of the original Bitcoin), while others have similarities but attempt to solve very different problems or address issues with the design of Bitcoin. For example, one real problem for Bitcoin is that each transactions can take a long time to fully confirm against the blockchain: sometimes as little as ten minutes, but at peak times it could take scores of hours, due to the finite resources and distributed nature of the blockchain. Litecoin aims specifically to speed up transactions among buyers and sellers. Ethereum is a competing project that aspires to not just act as a replacement for currency, but also serve as a platform for building a variety of apps that make use a blockchain to store data or calculate distributed tasks, facilitating "smart contracts" and replacing centralized cloud vendors with a distributed model of networked nodes. While Bitcoin has fallen significantly from its peak valuation this month, Ethereum had more gradually gained valuation. Both are down sharply over the last two days following news of new regulations that may hit South Korea. Individuals can research what cryptocurrencies they think will increase in value and buy any dollar amount of these cryptos using Coinbase, which offers both a website and iOS app. This involves creating an account, connecting an existing bank account and buying any amount of a specific crypto. Coinbase performs transactions for a fee, and then holds the user's digital wallet, erasing any issues with losing one's laptop or phone, or misplacing encryption keys. Of course, the user will have to retain and secure their Coinbase account information. The iOS app lets you keep tabs on price changes by sending alert notifications when the price of a certain currency drops below or rises above a given threshold. Users can then sell their crypto and return the value of the funds to their bank account (or PayPal account) in local currency. Coinbase can also send crypto directly to another digital wallet or receive crypto from another digital wallet. Some sites also allow you to buy goods and services in bitcoin directly from your Coinbase account. This includes travel site Expedia and retailer Overstock.com, along with sites like eGifter that sell gift cards that can be used to make purchases on Amazon or other retailers, including iTunes redemption codes. There's also a smattering of scattered restaurants that accept Bitcoin, and you can use Bitcoin to make ideological donations to Wikipedia or as tips to other users on Reddit. Apple is currently working with banks to establish Apple Pay globally, making it unlikely that it would rush to back cryptocurrency in a way that might appear to position it as a threatening competitor to existing financial institutions. However, with Apple Pay Cash, which enables users to transfer funds directly, Apple could make it easier to host a user's own funds held in a crypto account, potentially even delegating the business of holding funds to other third parties such as Coinbase. Between late 2013 and across 2014, Apple delisted a variety of popular crypto trading apps (including Coinbase) from the Apple Store, related to an "unresolved issue." It later clarified its review guidelines for virtual currencies, noting that "Apps may facilitate transmission of approved virtual currencies provided that they do so in compliance with all state and federal laws for the territories in which the app functions." Last December, as Bitcoin prices surged and caught the attention of new audiences, Coinbase became the top download in the App Store. It currently sits at number 80 among free App Store titles. Oh, boy. I'd not recommend Coinbase, just like I'd not recommend using Kraken. Both exchanges with major ongoing problems with scale. And I'd certainly not recommend any of the overseas exchanges. They are very problematic. Over the past several days, crypto has been going through a bloodbath and many exchanges are having volume problems. I can recommend the exchange, Gemini instead. They strictly adhere to US laws and have no limits on trading volume or monthly limitations on dollar value. Gemini is not yet licensed in all US states. The smaller exchanges are underfunded and some of them are teetering on insolvency, based on their time spent offline during heavy trading sessions. Fair warning that Bitcoins transfer fees to move out of an exchange are pretty stupid right now. What's pennies on Litecoin and Ethereum could be 10-20USD on bitcoin. If you hold a fair bit, you should move out anyways, a coin you don't hold is an IOU, not a coin. And another thing, if one holds ANY crypto of note, keep it on a cold storage wallet (one not connected to the Internet or any kind of wireless). Keeping crypto on an exchange or in an online wallet is insanely risky. I’m not so interested in the cryptocurrencies themselves, but blockchain programming seems to be an exploding career opportunity. Indeed. It's where all the money is going these days. Eh. It's wildly inappropriate for pretty much any of the uses which have been proposed. Think of it as a planet-scale database transaction log. Entering new transactions requires a global (in this case, literally) write lock. Enormously, mind-bogglingly inefficient. The Bitcoin network as a whole currently consumes more power than quite a few entire countries, all to do math which doesn't actually solve any problems. So while yes, there is a lot of demand for individuals to do this, it is a bad idea for humanity. Quantum computing will also eventually render all of the work meaningless. Factorization using Shor's algorithm will break almost all modern crypto, not just what is used for cryptocurrencies. Take a look at that Bitcoin valuation chart and then this example of an asset bubble taken from a literal textbook. Get familiar with Hashgraph. It’s what happens after cryptocoins and the Blockchain are worthless. In fact, it’s starting to happen now. Currency serves two important functions: (1) medium of exchange and (2) store of value. Bitcoin et al are entirely focused on (1) while totally ignoring (2). Without a mechanism for ensuring stable value, Bitcoin cannot succeed as a currency. Historically central authorities have been needed to give people confidence in using a currency as store of value. It would be interesting if there were a decentralized way to do that, though even if there were, it's not obvious that it would be more efficient. Still, though, it would be interesting. Perhaps the mining algorithms could have a built-in a mechanism for adjusting the supply of money in response to demand in order to maintain a stable price? The US Dollar, a fiat currency, is a fraud. It’s money backed by nothing. The reason cryptocoins are so volatile is because of the relatively small number of people using them for exchange purposes. I believe much of the financial activity surrounding them involves speculation. If and when there are countries willing to adopt the most widely recognized and popular “coins”/crypto for regular commercial activities as currency and not treat these things like a class of taxable assets... THEN we’ll have something. Personally, I think Hashgraph will undermine the entire Bitcoin and Blockchain system and make it all obsolete. It seems kind of ironic to say on the one hand that the dollar is a fraud because it’s supported by nothing but the US government and on the other hand say that crypto currency could really take off once governments start supporting them. And yet ask anyone who has bought bitcoins in the past few months/weeks and 99% of them will say "because the price has skyrocketed lately, so it must be a great investment (or at least a get rich quick opportunity)." 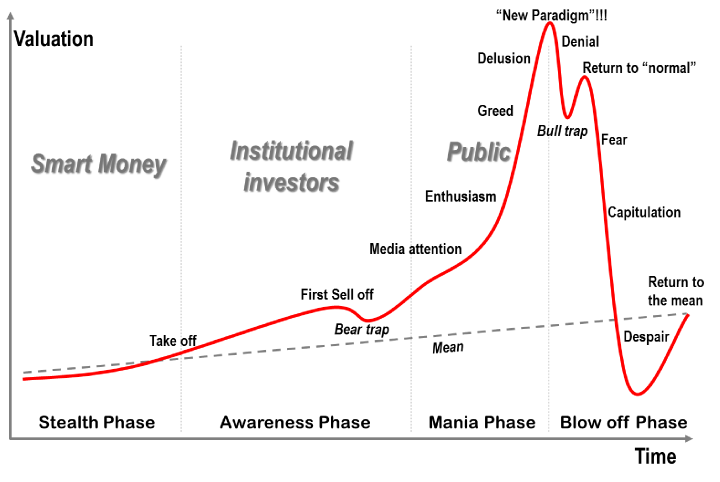 As others have pointed out, the only reason Bitcoin is getting any attention at the moment in the general culture is because of it's role as the latest speculative bubble. No one is buying bitcoins because they want a better medium of exchange--or in a practical sense "no one" is. I actually upvoted your comment, but the reason why it matters is recognizing the difference between a commodity (as it is recognized today) versus a currency. If recognized as currency, the need to record and report capital gains profits every time a "coin" is used in the course of commerce goes away. Imagine the problem as it is today... say you have 3 Bitcoin (BTC) and you use a fraction of that to buy a cup of coffee. Simply redeeming your BTC to buy that cup of coffee requires you report your capital gains on that tiny purchase to the IRS. Ridiculous, right? In an economy in which "currency competition" is allowed to flourish, the people will simply choose whichever currency provides them with the greatest stability, ease of use, portability, liquidity and security. I guess I'm "no one". The rise in bitcoin has been a really nice side-benefit that I've appreciated (heh) over the past couple years. But the main reason I even bothered with it at all is because it allows one to engage in cash-like (anonymous) transactions remotely, i.e. over the internet. Most people don't know how to ensure their transactions are 100% anonymous, but at the very least it removes most of the "spyware" inherent in today's plastic transactions.